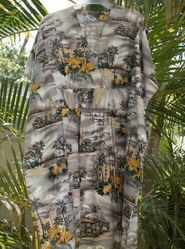 These loose fitting muumuu dresses resemble somewhat the style of the traditional Japanese Kimono Dress. The benefit of these dresses are they can adjust to fit any body size as they are roomy and comfortable. These muumuu dresses are adjusted to your body size by a specially designed and positioned matching cloth tie that is located above the midsection and just below the chest on the front. It enters the inside of the dress from the sides and is tied together on the inside back of the dress out of site. The draw tie is secured by lifting the dress up from behind and then tying. 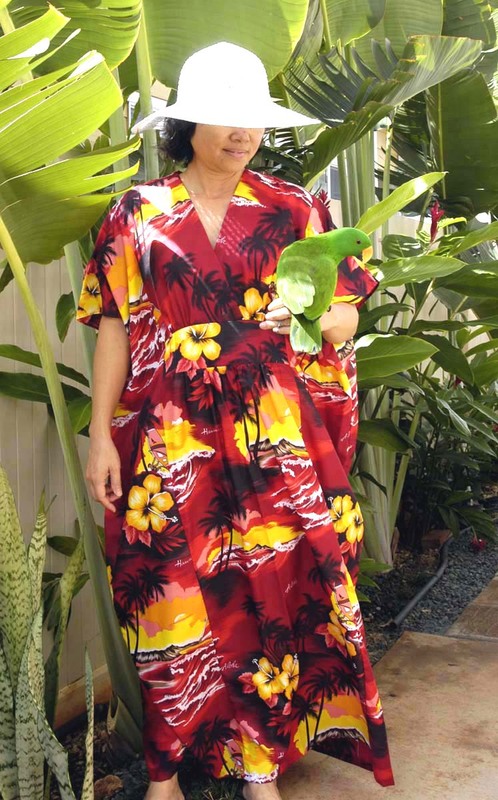 These Kimono Style Muumuu’s are made of 100% Polyester. Click on the selections to see which material each particular dress is made of. One size fits most up to 3XL. Chest area: 64", Buttock area:70", Length: 53"
If you want a shorter length you can cut & hem bottom. Click on the selections below for a larger view.